Illustrated manuscript in Latin on paper, bound in one volume with a 'cuir-ciselé' binding and its original chain still attached this manuscript consists of: Johannes Chrysostomos, "Homiliae super Mattheum" – Gregorius I, "Homiliae super Evangeliis" – Origenes, "Homiliae" – preceded by: "Arbor consanguinitatis". 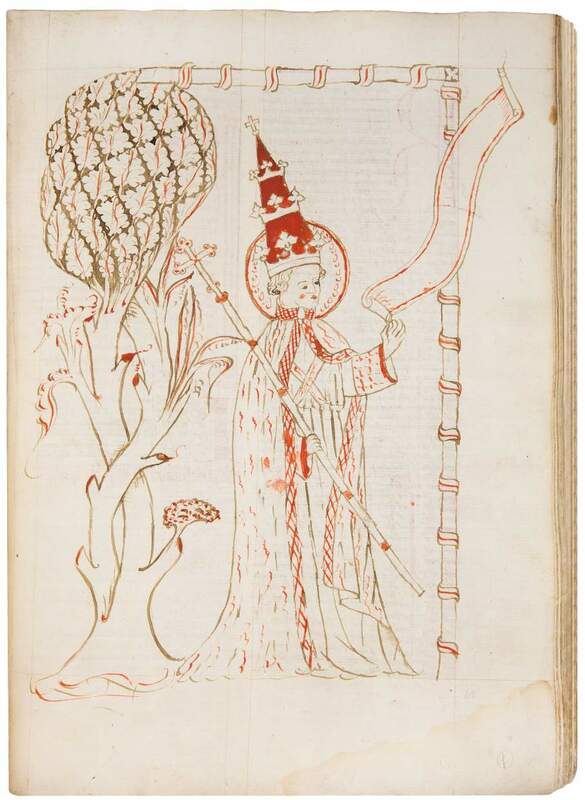 Illustrated manuscript in Latin on paper. 410 x 280 mm. – 108 leaves. 2 large pen-and-wash drawings highlighted in red, one genealogical table. More than texts, this codex also offers a view on its historical, rather tragic context. The scribe not only delivered a book of homilies, he also added some personal notes in German on the extreme cold wintertime of 1407-1408, prices of food, and some local troubles. Moreover, the manuscript is also an extraordinary document of dramatic events in church circles of the late 14th and early 15th century in Austria. The texts were copied by Nicolaus Nicolai, a vicar in Piesting near Wiener Neustad who dated his work in 1407 and 1408. He also introduced the two most important treatises with a lively portrait of the author. The two pen-drawings present John Chrysostom and Pope Gregory as medieval saintly bishops and church fathers. Chrysostom holds a scroll in his hand and sits on a bank, while Gregory is shown with a crozier, standing before a stylized tree. Both charming, somewhat naïve drawings, reflect an unsophisticated warmth and suggest a hand that was not without experience. The Homilies of John Chrysostom were sermons which, direct and personal in style, provide insight into early church history, theology and bible exegesis. History records that Thomas Aquinas said he would give the whole city of Paris for a copy of this text. Homilies by Pope Gregory discuss the practical concerns and theological expectations of a period when the church had to deal with serious problems caused by invading barbarians, administrative transformation and changing monastic practices. Two more sermons by a third author, Origen, comment upon the Birth of Christ and on Mary Magdalene. Such a book would have been made for study, in this case for use among clerics in the medieval church of Our Lady at Wiener Neustadt – where the codex was in 1446, as we know from a note. Because large study books were rare and valuable items, they often were chained onto a sliding rod on a lectern where they could be consulted but not taken away. In later days when books were shelved in repositories, most chains were removed and nowadays original chained bindings are quite rare to find. To reinforce the remarkable cuir-ciselée binding a charter was used as flyleaves in front and at the end of the book. Such a use is not uncommon, but in this book is quite particular. The document deals with a legal case at the monastery of St. Michelsberg (near Bamberg) against Konrad Wallingraben from Piesting and confirms his excommunication in 1390. He had been found guilty of illegally taking possession of the parish of Nicolaus Nicolai of Piesting (the copyist of this manuscript, Piesting is a town some 50 km south of Vienna, and some 15 km northwest of Wiener Neustad). A long procedure did not solve the problem and Wallingraben continued to read Mass at Piesting. Nicolaus then may have raised his income by copying books – which he did quite well as shown here. The manuscript itself was completed in 1408, after which a tragic note was added saying that copyist Nicolaus had been murdered by a knife in the hand of the rustibaldus (a contamination of rusticus and ribaldus). The circumstances are not revealed but one can imagine that this was the end of a long conflict that escalated into an act of revenge. As an original chained book with dramatic notes of excommunication and murder, this book is quite a tantalizing historical document. Further information on Austrian chained binding in 'cuir-ciselé' technique is available in one of our blog posts.